The end of the challenge is quickly approaching, only one week away from the final reveal! It’s been an agonizing week deciding on paint color for the interior cabinets. The One Room Challenge™ HERE consists of twenty design bloggers taking on the challenge of transforming a space. Every Wednesday, the designers document their process and share their sources and advice over six weekly posts. They are doing an incredible job and will reveal their make overs next week..be sure to check them out! I have joined the ORC as a guest participant this season redesigning a room in our home. You can catch up on all our progress, along with the before pictures, and project details from prior weeks below. What an incredibly hectic but successful week we had with our bar reno! The cabinet doors, the island and the fireplace surround have been painted. The walls have also been painted and all the protective plastic tarps have been removed from the space. We also installed the interior and under mount cabinet lighting….and wow, what a big transformation! In addition, we purchased and completed the installation of a new beverage refrigerator and ice maker. Coincidently, the beverage refrigerator gave out during the reno, so that replacement was added to the project last minute. Unfortunately, we had a set back with a delay in getting the glass panes and shelves for the cabinets, but still hopeful they will arrive in time for the reveal. But now, my dilemma, deciding what color, if any, to paint the interior of the cabinets. Frankly, deciding on the direction I want to go has been troubling…and costly. Option #1. This is what the cabinets look like without any paint on the inside. The brown stain is the original color of the cabinets. I like the contrast of the brown interior and black exterior. But you have to imagine the cabinet without the wood shelves, since we will be replacing them with glass shelving. Option #2. Painting the interior a contrasting color to the cabinets. Another very nice look that I really like, brings in that designer touch. Option #3, paint the interior of the cabinets the same color as the exterior. What Interior Cabinet Paint Color Did We Choose? After careful consideration, we chose option # 3 for the space, painting the interior of the cabinets the same color as the exterior. Ultimately it came down to feel of the room, and keeping with the style that already exists. Painting the interior cabinets a darker color will create a more european old world feel for the space. And yes, we painted all the interior cabinets white and had to repaint them after we made our final decision. The area above the sink is also giving me angst. I have changed my mind more times than I care to admit on what should be placed in the space between the cabinets. A mirror? Clock? Shelves? Mantel? Picture..if so what picture? So many options! I made a decision, and have an item on order with rush delivery…hoping it will arrive in time for the final reveal. We, (my husband), installed the cabinet hardware on the cabinet doors and drawers. It is a time consuming process which requires drilling additional holes into the cabinets and drawers. 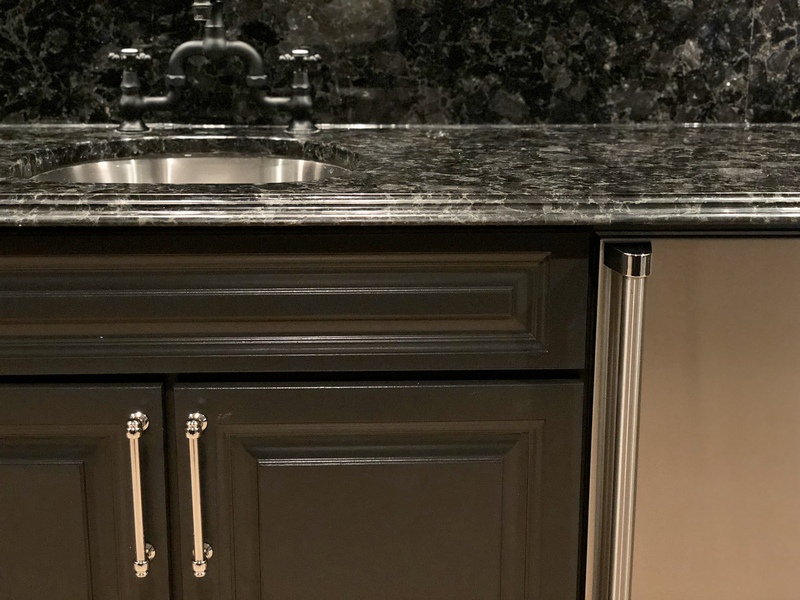 We installed a combination of 4 inch, 6 inch, and 8 inch polished nickel pulls on the cabinet doors and drawers; approximately 40 pulls in total. The process took a long time but was worth it…they look fantastic! Let’s look at what we have completed so far and what is left to do. Going to be a busy week going into the home stretch. We have several items left on our list that need to be finished and many are time consuming. But we feel confident in our abilities and our desire to have this project completed on time! Next week..The Big Reveal!!! Make sure to check back to see our completed Renovation and a little surprise. (Hint: super tacky..glitzy and spins) Can you guess what it is? I love how your cabinets turned out-they add so much drama to the space! Best of luck with this last ORC week! Here’s hoping it all comes together down the home stretch! I have been enjoying your ‘one room challenge’ posts. Love your choices. Thank you so much, how sweet of you! They are fun to do, stressful but fun. You guessed it!!! Way to go Denise! Almost finished? Can’t wait to see the final outcome! You go, gal! Almost done…Phew! Can’t wait!!! Thanks for visiting.